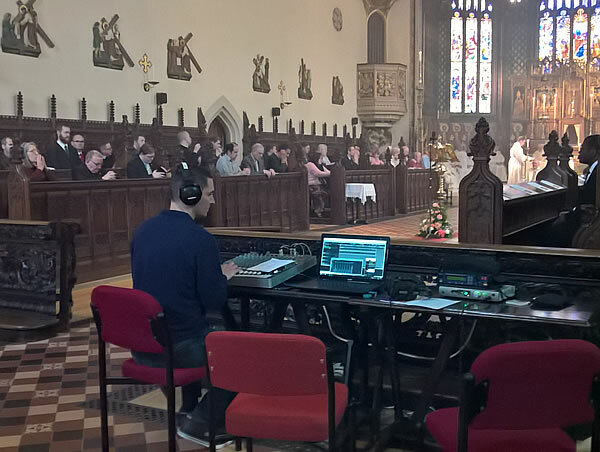 A Lyra audio interface and SADiE 6 software delivered the perfect solution for a complex location recording project at Buckfast Abbey in Devon. Cambridge, UK: June 10th 2018: “Solid, reliable and exactly what you need when you’re recording live sound and have to get it right first time.” This is how Dave Kitto, partner of Clifton Bank Studios, describes his location recording set up, which consists of a Prism Sound Lyra audio interface and a laptop running SADiE 6 software. Based in Leicestershire, Clifton Bank Studios is a one-stop audio and video facility offering studio and location recording, audio editing, audio and video transfers and CD and DVD production. Clifton Bank Studios recently took its Lyra and SADiE 6 system to Buckfast Abbey in Devon where Kitto recorded a group of singers for the Institute of Liturgical Music and the Association for Latin Liturgy. This project, which spanned two years and has only just been completed, involved capturing the Graduale Parvum, a selection of Gregorian chant Introits (sung masses) that are sung by Roman Catholic choirs and congregations at regular Sunday services and special services for major feast days. The recording session took three days to complete and the files were taken back to Clifton Bank studios for editing. The recordings, which will eventually be available on line, have already been released as a five CD boxed set that is selling well in the UK and the USA.